Chanted prayers with meditations (called “pujas”) are an important component of training in a spiritual life. 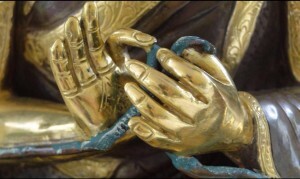 They help us to still our mind, connect with enlightened beings, receive blessings, and meditate well. We use ancient prayers that that have been translated into English. The prayers are available in booklet form, and are also recorded (so it is easy to follow the words, and participate in the puja even if you are a beginner). 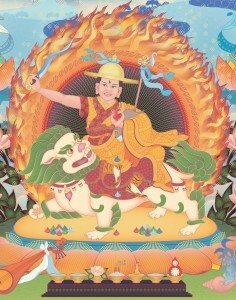 Our primary daily practice is Heart Jewel, combined with meditations on the stages of the path (Lamrim) and Mahamudra; twice a month we have special prayers called Offering to the Spiritual Guide (see below); and we also do some prayers on a monthly basis, such as, Prayers for the Deceased - Powa (see below), and Kangso or Melodious Drum Puja (see below). For those who have received a Highest Yoga Tantra Empowerments, there are twice weekly Highest Yoga Tantra prayers (see below). Everyone is welcome to come to any of these chanted prayers with meditations free of charge. 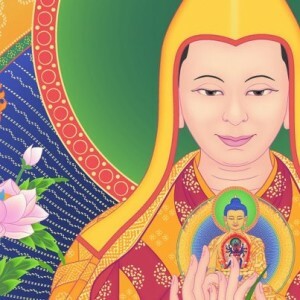 This puja gives us the opportunity to affirm and strengthen our heart relationship with our Spiritual Guide and receive blessings that help us develop in compassion and wisdom. In Kadampa Buddhism, the Spiritual Guide is regarded as being like a parent who cares for us, protects us, and guides and helps us on the spiritual path to enlightenment. 10th and 25th day of each month. Please call the centre one or two days beforehand to check the start time. Tara is a female Buddha, a manifestation of the ultimate wisdom of all the Buddhas. Her name means “Rescuer” because she rescues us from all outer and inner fears. 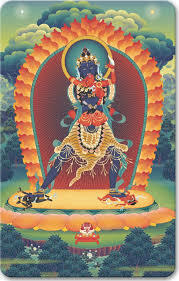 Ultimately she rescues us from all suffering and guides us to full enlightenment. Like a mother she protects us from all internal and external dangers; she provides us with all the necessary conditions for our spiritual training, and guides us and inspires us with her blessings as we progress along the spiritual path. These prayers include praises to the twenty-one manifestations of Tara. 8th day of each month. Please call the centre one or two days beforehand to check the start time (we will also try to make sure that times are put on the calendar closer to the date). This puja is a powerful practice which helps us overcome difficulties in spiritual progress and to protect us from difficulties in the future. These are extensive prayers to help us gain good fortune, remove negativity from our mind and gain positive energy. During the prayers we make offerings of food (tsog) to our Spiritual Guide as someone who protects our progress on the spiritual path. These are set out very beautifully on plates on a table in front of the shrine before the prayers start. The purpose of making food offerings is to improve our mind of giving. You are welcome to bring your own offerings. After food offerings we make prayers to remove any obstacles that may arise on our spiritual path & to protect us from losing the positive states of mind we have already attained. The prayers take approximately 3 1/2 hours with a tea break of 10 minutes in the middle. This puja is held for those who have died recently. Its purpose is to help them have a fortunate rebirth in a pure land. Pujas can be for friends, family, a special animal, or as a way of expressing our compassion for those who have died as a result of disaster or war. It can be a very peaceful and uplifting method of expressing our love and our heartfelt wishes for their future well-being and peace. Powa pujas are generally held in response to requests from members of the community (students, friends and the wider community). Please contact Demo if you would like to arrange a puja for anyone close to you. This puja is help for more experienced practitioners who have taken special Highest Yoga Tantra Empowerments.